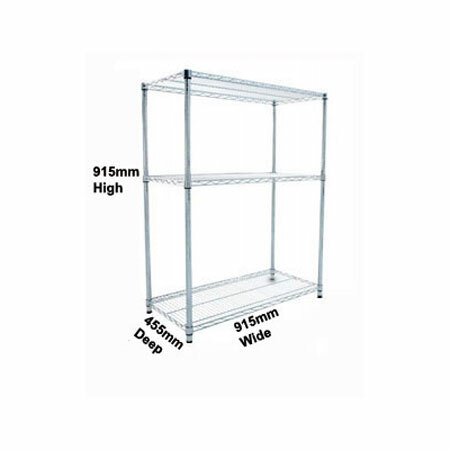 Wire Shelving Bay R9114 - 915mm High x 915mm Wide x 455mm Deep Bay with 3 Shelves. Online Shop | Back To: Brands | Back To: Warrior Wire Shelving | Back To: Wire Shelving Units 3 Shelf Levels 915mm High | Wire Shelving Bay R9114 - 915mm High x 915mm Wide x 455mm Deep Bay with 3 Shelves. Shelves x 3 : 3 x 915mm (3ft) wide x 455mm (18inch) deep chrome plated steel wire shelves capable of carrying 150kg (330lbs) per shelf.